8x White Melamine Chopsticks with coloured Oriental engraved pattern. Beautifully designed and crafted porcelain tableware: luxurious and practical, the perfect way to present quality cuisine AT AN AFFORDABLE PRICE. 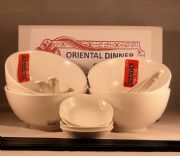 All these Oriental white Hotelware pieces conform to B.S. 4034: 1990 and have strengthened rolled edges to offer chip resistance. 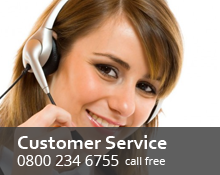 The range is fully vitrified to ensure each item is completely dishwasher, microwave and freezer proof. 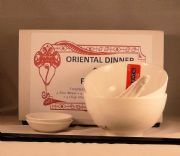 The melamine chopsticks are extremely durable and dishwasher safe. Also available in a set for two people. 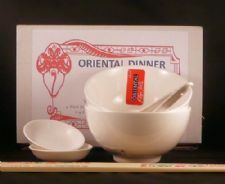 Vitrified Porcelain Chinese White Dinner Set for TWO - Rice & Dip Bowls Spoons Black Melamine Chopsticks. 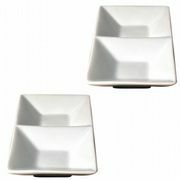 Two Restaurant Quality, Oriental, Chinese, Vitrified Porcelain Divided Double Dip Dishes. 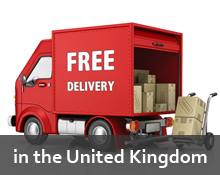 Use the box above to enter your e-mail address to find out about our lastest news and offers. Our payment systems are fully secure. We accept the methods shown above. Copyright 2013 © Hospitality Quality. All Rights Reserved.